Solar power, once thought to be only for the wealthy, is now helping rural poor reduce their energy bills. Americans who live in mobile homes are particularly vulnerable to energy poverty. But a new program could get them clean energy and provide long-term savings, says Bentham Paulos. While many think of poverty as an urban problem, the truth is that some of the poorest communities in America are in rural areas. The quintessential example of rural poverty is the trailer home park. Manufactured homes, formerly called trailers or mobile homes, are often built in neighborhoods owned by a single landlord, though can also be built on individual lots. And incomes are low. 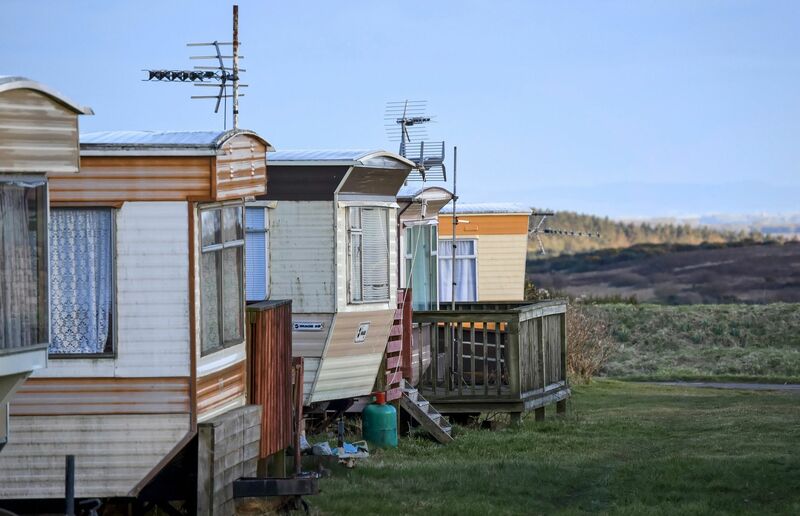 According to the Census Bureau, the median household income of occupants of a manufactured home was only $28,400 last year, compared to $48,000 for all housing types. Almost a quarter of mobile home households have incomes under the federal poverty level. There are 357 manufactured home communities in the state, according to the New Mexico Manufactured Housing Association, but even more manufactured homes are not in trailer parks, but are on land owned by the homeowner. They are especially common in the Española Valley, a rural area that is 89% Hispanic, just north of Santa Fe. Mobile homes are about 30% of homes there, and 22% of all households live under the federal poverty line. While the quality of manufactured homes has improved in recent years, older homes are notoriously energy-inefficient. Poorly insulated, with low-quality windows, they can saddle their low-income owners with high energy bills. “For low-income families, electricity is usually the third biggest item after lodging and food,” says Hughes. But Hughes and his colleague Mark Gaiser are working on new approaches to cut energy bills using solar power. Because the roofs of manufactured homes are not always able to support the racks and panels of a solar system, Hughes and Gaiser are looking instead at ground-mounted solar systems. 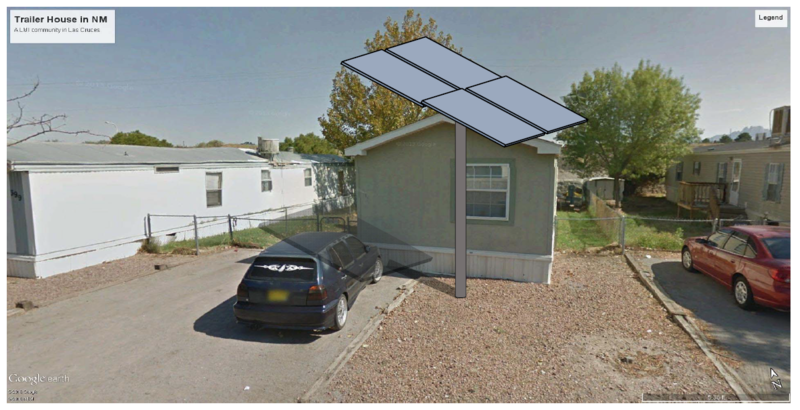 To cut installation costs and save space in a crowded trailer park, they have developed an ingenious “solar on a stick” design, with four 300-kilowatt panels mounted on a single pole. The whole thing will sit on a four-foot-long industrial screw to reduce installation costs, drilled into the ground using fence-making equipment. Gaiser would like to use trackers so the panels could follow the progress of the sun, increasing their energy output. But trackers on the market now are too expensive, so he is trying to adapt car actuators to be a low-cost, time-based tracker. Gaiser thinks he can get the installed cost of the system down to about $2 per watt, or $2400 for a 1.2 kW system. Residential rooftop systems in New Mexico are currently more than twice that price. That price will also put them in the ballpark with the large ground-mounted systems that the local electric coop, Kit Carson, is installing. The coop is planning to get 100% of its summer peak demand from solar within five years, putting in thirty 1 MW systems. Gaiser plans to get a prototype up by end of the month, and work with local colleges to get 10 more installed by May of next year. In the end, the state office will release an “open source” strategy and design, using primarily off-the-shelf parts. The plan is to find a company to make the mounting systems locally, and install them for rural customers of all kinds. But they are especially interested in getting the benefits to low-income households. “We are looking for non-profits that would want to take up the challenge,” Gaiser says. One non-profit that is bringing solar to low-income rural households is the Rural Renewable Energy Alliance (RREAL), based in Minnesota. RREAL has been working to reduce energy bills for residents of manufactured homes in the Upper Midwest, delivering weatherization and home energy assistance programs. Federal taxpayers pay $3.4 billion per year in energy assistance programs. And while the Trump administration proposed zeroing-out the program, Congress is likely to continue funding. RREAL advocates for using solar to provide long-term savings and self-reliance to low-income households. “We are hemorrhaging public resources without providing a long-term solution or addressing the root causes of energy poverty,” says Jason Edens, Director of RREAL. RREAL has specialized in solar air heaters, essentially wall-mounted black boxes that heat up on cold sunny days and warm up a home. But the low cost of solar photovoltaics has made PV a more competitive option. RREAL recently completed a project with Leech Lake band of the Ojibwe Nation, installing five 40 kW solar systems on tribal properties. The savings from the solar will be directed to low-income energy assistance for tribal families. It is the first 100% low-income community solar installation in Minnesota, as well as the first in the country on tribal lands. “Solar assistance is literally moving families from impoverished to empowered,” says Edens.